When you're flying internationally, you're likely spending the flight time catching up on sleep, watching a few movies or maybe even reading a book. But on Friday one mama spent her 3-hour flight from Puerto Rico to Florida giving birth. A JetBlue spokesperson confirmed to local media that a baby was born on Flight 1954 from San Juan, Puerto Rico, to Fort Lauderdale with help from JetBlue crew members and medical officials who were onboard. The names of the new mom and her baby were not released, but JetBlue team members have been joking that they'd like to rename the plane (called Born to Be Blue) after its youngest ever passenger. "Giving storks a day off. With mom's okay, we'd like to rename 'Born To Be Blue' after our newest baby blue and our youngest customer ever. More baby shower gifts to come! #AirBorn," JetBlue tweeted. If you're having déjà vu you may be remembering a similar incident that happened last year, when mama Toyin Ogundipe unexpectedly spent her January flight from Paris to New York in labor. Thankfully, also onboard was Dr. Sij Hemal, a second-year urology resident at Cleveland Clinic's Glickman Urological and Kidney Institute. 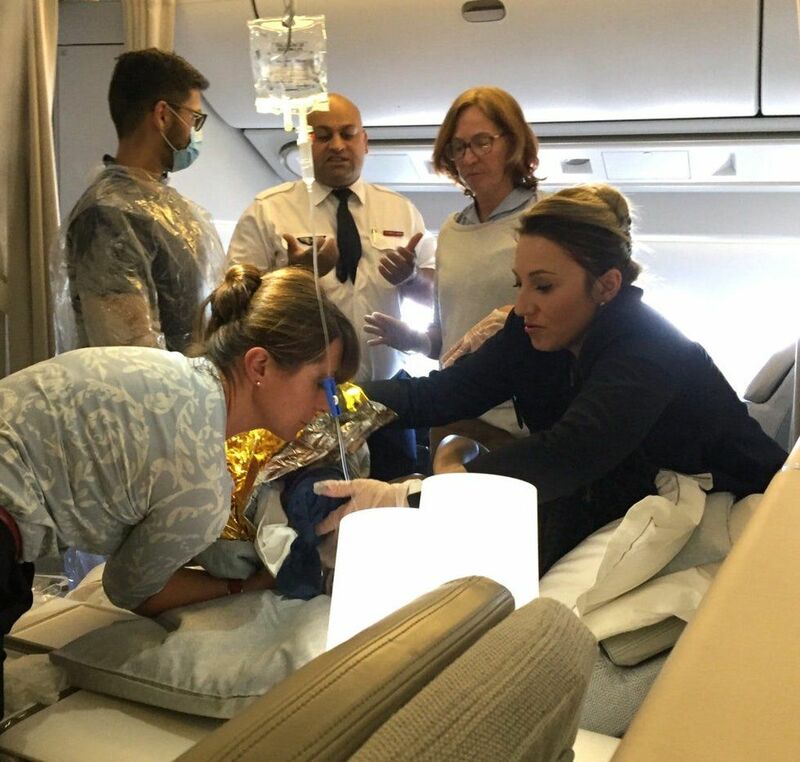 When flight attendants asked if there was a doctor on board, he didn't hesitate to pass on the glass of champagne he was awaiting and instead offer to help. Once he saw Ogundipe was having severe back pain and was pregnant, he realized she was in the beginning stages of labor. Although Hemal is a urology specialist, he has fortunately helped with delivery before. After Hemal and Dr. Susan Shepherd, a pediatrician aboard, began monitoring their in-flight patient, Ogundipe's contractions began to speed up and they knew she was going to deliver her baby before they could land. “I was relaxed because I knew I was in safe hands. They did everything a doctor or midwife would have done if I was in the labor room in the hospital. Even better, if you ask me," Ogundipe said in a statement. According to that statement, Ogundipe only had to push for 30 minutes. Then, using a surgical clamp, shoestring and scissors, the doctors were able to remove the placenta safely. Dr. Shepherd made sure new baby, Jake, seemed healthy and even led him to nurse on mama while she recovered after giving birth. After landing, Dr. Hemal made his connection for his flight to Cleveland—and went home with a bottle of champagne and a travel voucher. Hemal is also in contact with Ogundipe—because while every mama has a birth experience she won't forget, this was likely one that many others will always remember, too. As for the big question of where a baby born on an international flight gets citizenship: According to the United Nations, a baby born in the sky is a citizen of the country where the airplane is registered. But the United States is even more generous—offering citizenship to any baby born above the borders. In his book Unruly Skies, Newcastle University professor Alastair Bonnett explains what this means, “If you are born over the United States, in a foreign plane with foreign parents, you can still claim U.S. citizenship." You can also claim to be the most well-traveled newborn in the playgroup.